I started the long road of Eisa, a contemporary drum dance of Okinawa because I do adore Okinawa and, gradually, this emotion made me to desire to come into contact with its culture, especially its drum dance. My first encounter with Eisa was in 2007, when I traveled around Okinawa together with my friends for sightseeing. I had the opportunity to see the “Ichiman-nin Eisa’’ festival, one of the most famous Eisa festivals in Okinawa where many Eisa groups perform every year since 1995. Their dynamic performances mesmerized and overwhelmed me and, from that day, my interest in Eisa has increased day after day. One of the groups has left a strong impression on me and awoke my passion for dancing Eisa: Ryukyu Koku Matsuri Daiko (RKMD). In 2008, I came across RKMD Tokyo branch’s recruitment for summer members, in order to dance in great numbers during big events and offer the visitors a chance to participate in the dance. I applied immediately for it, and was accepted in the dancing group. 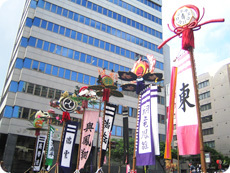 On July 26 of that year, “Shinjuku Eisa Festival’’ was held in Tokyo and many groups of Eisa participated in this event. This day is a memorable day in my life, as this was my initial experience with dancing Eisa among a large number of spectators. After this experience, I wanted more than ever to dance it again. Therefore, I officially joined RKMD Tokyo branch as a regular member. In 2010, Junichiro Mizuno, my mentor of Eisa, who had been the leader of RKMD Tokyo branch, gathered some members eager to improve the quality of their performance, and created Ryukyu Budan Shoryu Matsuri Daiko. This group was aiming to expand the recognition that Eisa is a wonderful dance all over Japan. As his disciple, I had the chance to take part in various Okinawa-related events and learned many things from our seniors and the people supporting us. In 2014, thanks to all the members who supported me all the time, I was chosen as the second leader and I have redoubled my efforts in order to fulfill members’ expectations. As Shoryu Matsuri Daiko was recently formed, we do not have yet much experience, and still have many things to learn. From now on, we want to overcome all hardships and continue to show our performance and stage effects full of originality and ingenuity. We will do our best to convey to everyone watching us the beauty and the emotion of dances from Okinawa, so we hope you will give us some advice and support. Before I realize it, it has already passed twenty years since I started the new contemporary Eisa group in Tokyo in February, 1996. We have performed in many events Okinawa-related in various parts of Japan, mainly in Tokyo, and have propagated the charm of the contemporary Eisa and Okinawan culture. 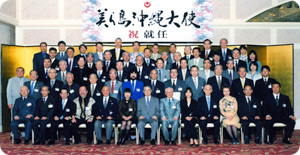 The Okinawa prefecture appreciated our cultural activities and highly regarded us as one of the most influential organizations of Okinawan performing arts, and they gave me the role of “Churashima Okinawa Ambassador’’ which is the institution created in order to promote Okiniawan culture throughout Japan. 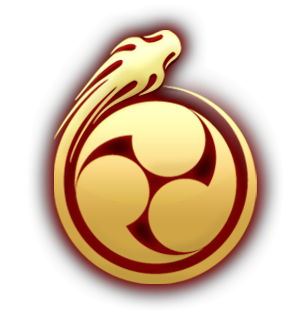 That honor is awarded to the person who has the deep understanding and attachment to its culture. Over the past several years, since I came to Tokyo from Okinawa, an unsatisfied desire to promote Okinawan performing arts in Tokyo was burning within me, owing to ardent love for my hometown. Frankly speaking, contrary to my long-cherished dream, the promotion of Okinawan culture was not advancing quickly. There are so many elements in Okinawan culture, and it was difficult to select which ones to promote. Around that time, during my struggle, I had a fateful encounter quite incidentally in Okinawa. In 1995, when I returned to my hometown, and participated in the annual “Naha Ohzunahiki’’ festival which is the tag-of-war event; the Eisa-performance of RKMD, dancing to the rhythm of the music “Mirukumunari,’’ came into my view. I was deeply fascinated and terribly moved by their impressive dynamic performance. This touching experience motivated me to start Eisa; in response to my desire about it, they accepted me into their organization, and appointed me to the leader of RKMD Tokyo branch. From that day, my long journey of Eisa has begun. After that, I have earnestly devoted myself to practicing Eisa, fostering capable members, and propagating the charm of Okinawan culture. Thanks to my contribution to Okinwan culture and performing arts, I have received various awards and many honors. In 2012, I was designated as “world Eisa Ambassador’’ that is given to the person who has propagated the attractiveness of Eisa and realized strengthening the bonds of friendship among the people and groups of performing Eisa. Keeping the deep impression of initial encounter with Eisa in my mind, I intend to plan various events to attract many tourists to Okinawa, and continue to make every possible effort to promote Eisa through our performances in Tokyo, in Japan and eventually all over the world. Practically, it is not easy to propagate the charm of Eisa in various parts of Japan and I experienced hard times. We once went through several years without being offered any appearance in Okinawa-related events. I became very negative and even considered giving up my unique mission. But, I have been able to break through all the hardship due to my faith that “Winter always turns to Spring.’’ I am now grateful for the hard days I experienced, and can see clearly today how they broadened my mind and ability to dance. I know now that every moment should be dedicated to fighting against the challenges we face in our Eisa-life. We appreciate all of the people supporting us, Ryukyu Budan Shoryu Matsuri Daiko, from the bottom of our heart. Ichiman-nin Eisa: “Ichiman-nin’’ means 10,000 people. “Ichiman-nin Eisa” is a very famous festival in Japan held by approximately 10,000 Eisa dancers on Kokusaidori, the main street of Naha in Okinawa. Many people from the youth groups gather and perform various sort of traditional and original Eisa styles. Ryukyu Koku Matsuri Daiko (RKMD): The world’s largest Eisa organization reaching the masses mainly in Okinawa, Japan, and the South America: Peru, Argentina, Brazil, and so on. 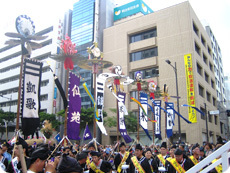 Shinjuku Eisa festival: This festival is held in Shinjuku, Tokyo every year since 2002. Churashima: It means “beautiful islands”, as Okinawa is composed of many beautiful islands. Ryukyu Project: An organization for the purpose to promote Okinawan culture. Naha Ohzunahiki: “tag-of-war” event held from June through August on the lunar calendar (July and September on the Gregorian calendar) in Okinawa. The main objective of the event is to pray for good harvest, large catch, rain, and warding off evil, while it is also believed to forecast the fortune of the following year based on the result. Miruku-munari: The rock music of Okinawa, the lyrics by Daiichi Hirata and the music by Hidekatsu Kamei. It is the famous music in Okinawa, Japan, and South America. “Miruku” means “the deities of nature” derived from the old Okinawan language, and “munari” is “dance” in Indonesian. This word was coined by Daiichi Hirata. In summary, the meaning of the song is to pray for a good harvest and that, thanks to the brilliant dancing of the deities of nature, we have a bumper harvest. The powerful melody inspires and moves whoever listens to it. What is Ryukyu Budan Shoryu Matsuri Daiko?